Beloved wife, devoted mother, grandmother, and friend to many. 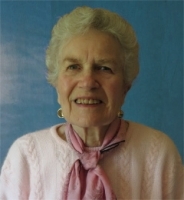 Mary Baczewski, 89, of Edmonds, Washington passed away suddenly on June 19, 2013. Mary was born in Minneapolis, Minnesota, the second of five children, to her parents Claude and Eleanor. She grew up in St. Louis, Missouri where she met her husband of 65 years, Zygmunt (Sig) Baczewski. They were married in 1947. Mary was a beloved wife, devoted mother of five, grandmother, and friend to many. In addition to maintaining a home as the family relocated between Houston, Texas and River Vale, New Jersey, Mary had a rich life filled with a multitude of interests and hobbies. She was an artist who loved to paint landscapes, portraits, and especially flowers. As a home seamstress, she made many beautiful outfits for herself and her daughters. She collected dolls and learned to hand craft her own porcelain dolls. Her love of music was expressed through a lifetime of singing and an innate ability to play any song by ear. After relocating to Edmonds upon her husband's retirement in 1982, they both studied and performed music on a home organ as members of the local "M&Ms" (Meals and Music) club. Mary was an avid gardener and bird watcher and always kept a full bird feeder outside the kitchen window. She was a skilled knitter and spinner and in recent years donated dozens of hand-knitted caps to Warm for Winter, a Seattle-based charity. Mary is survived by her husband, Sig; siblings, Grace and John; children, Xtine, Mosa (Mimi), Kathy and husband Jim, Philip and wife Joni, and Margaret and husband Stan; and grandchildren, Chris, Andrew, Nicolas, and Campbell. Mary was a member of St. Thomas More Catholic Church where her life will be celebrated at a funeral mass on Tuesday, June 25, 2013 at 11:00am (St. Thomas More Catholic Church, 6511 176th St SW, Lynnwood, WA). A reception will follow. Optional donations in lieu of flowers may be made to Warm For Winter, a local homeless awareness and gifting project that brings together persons of many faiths and backgrounds to create handmade hats and scarves for needy individuals and families in our region around the Thanksgiving season. Donations may be sent in Mary Baczewski's, checks made out to The Interfaith Network/WarmforWinter. Beloved wife, devoted mother of five, grandmother, and friend to many. Is our memory of you.